WEST SALEM, Ohio — The Wayne Soil and Water Conservation District (SWCD) held its annual meeting and banquet Nov. 17 at Northwestern High School to recognize producers and individuals for their conservation efforts. “We want to recognize those individuals with their boots on the ground,” said Matt Peart, Wayne SWCD board member, as he introduced one of two main award winners for the night. 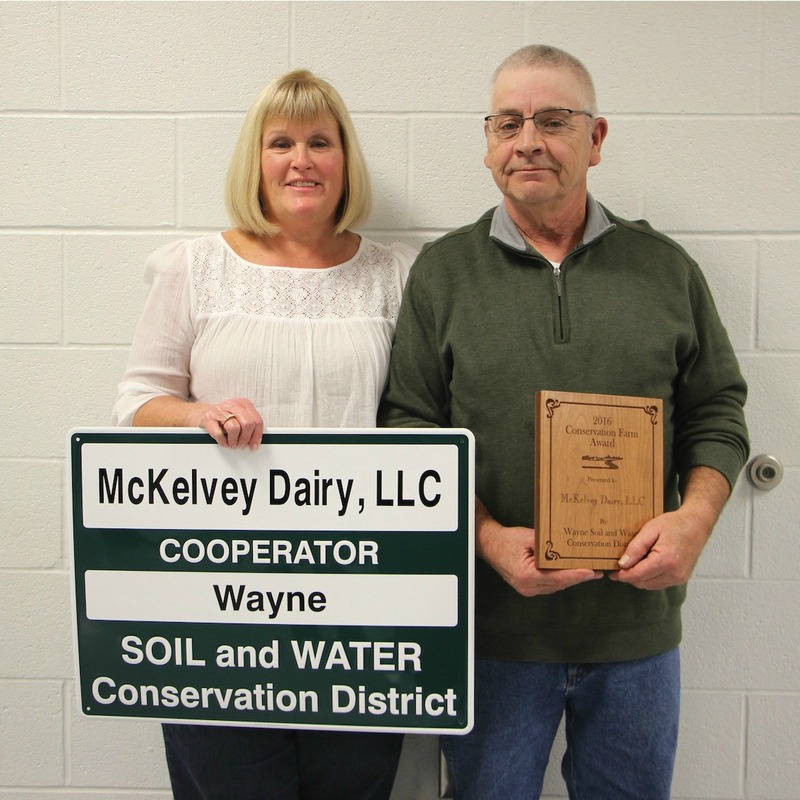 Kelly McKelvey (right) of McKelvey Dairy was awarded the Conservation Farm Award at the Wayne Soil and Water Conservation District annual meeting Nov. 17. He is pictured with his wife, Connie McKelvey. 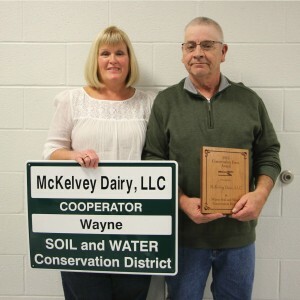 Kelly McKelvey, of McKelvey Dairy, received the Conservation Farm Award for his role in implementing conservation practices on the family dairy that are now being passed on to the next generation. McKelvey farms around 350 acres of corn, hay and small grains using mostly no-till and strip-till practices. Cover crops are used extensively — mostly rye grass for additional forage — and strip cropping and crop rotation practices are also in place. Grassed waterways, subsurface drains, nutrient management, waste storage facilities and composting are also used on the dairy. 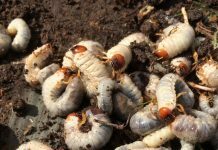 McKelvey’s manure storage facilities include a 2 million gallon earthen lagoon, a half million gallon earthen lagoon and a 40-by-80 foot compost facility. His commitment to conservation earned him the farm award this year, said Peart. Although many may think of the conservation education award going solely to a school teacher, “we feel it is just as important for adults and community members to promote and instill conservation outreach,” said Fred Myers, Wayne SWCD board member. 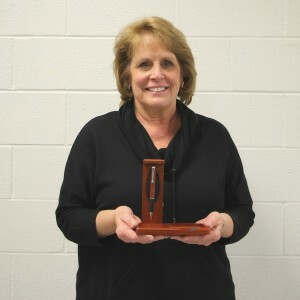 This year’s conservation education award was presented to Carole Van Pelt, who developed the Barnes Preserve in Wooster. The preserve was originally part of the dairy and beef farm at the Wayne County Home (now the Wayne County Care Center). The county home was founded by Van Pelt’s parents, Don and Dorothy Barnes. Carole Van Pelt was awarded the Conservation Education Award for her work with the Barnes Preserve in Wooster. Van Pelt’s mission was to create a park that would be fully accessible for wheelchairs and others with disabilities. When the county home could no longer run the farm, it was leased to the county commissioners and would eventually become part of the Wayne County Park District. “We originally started thinking about creating an equine facility until the barn burned down,” said Van Pelt. 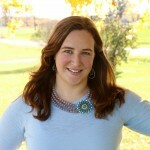 So, instead, Van Pelt made it her mission to create a preserve that could be used by all Wayne County residents. “Everything was specifically designed for people in wheelchairs,” she said. The pavilion, deck, parking lot and access drive were all constructed to the Americans with Disabilities Act standards. The project was a real passion of hers, having a twin brother who is disabled. Van Pelt received four state and federal grants and two local grants to make the 76-acre park a reality. The park has been used by Boy Scout groups, geocachers, and environmental and science classes, and includes close to a mile of nature trails, hiking, and wildlife observation opportunities. Many producers around the county took part in conservation practices to improve the sustainability of their farms. Six farms were highlighted for implementing manure and waste storage systems, a silage collection system, and grass waterways on their farms. 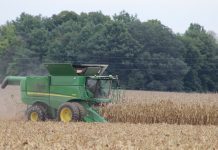 Throughout the year, Wayne SWCD was able to provide over $972,000 in cost-share programs through NRCS and fund 1,188 cover crop acres in Wayne County through the Muskingum Watershed Conservancy District. 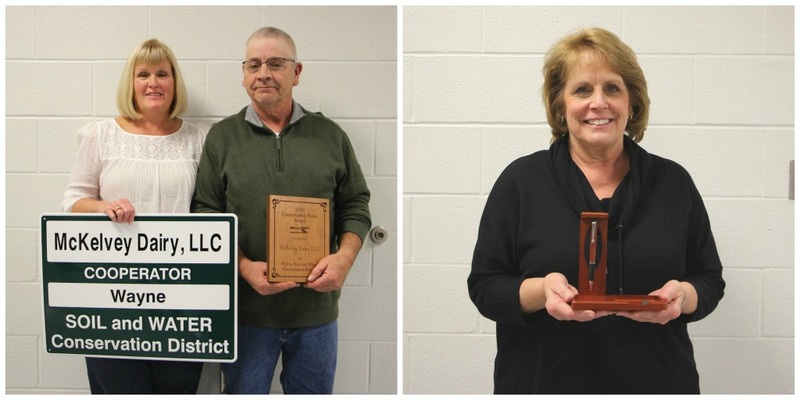 At the end of the evening, two supervisors were elected to the Wayne SWCD board of supervisors. Scott Stoller (re-elected) and Dustin Ramsier (newly elected) join John Redick, Matt Peart and Fred Myers on the five-member board.